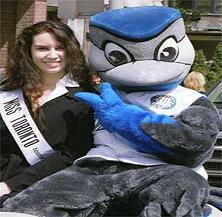 ​Miss Toronto Tourism was started in 1999. It has been newly managed by its Board of Directors since 2002. Miss Toronto Tourism can be seen at Events in Toronto and the GTA promoting Toronto and what a great City it is. in Toronto and the GTA. Contestants are picked for their Intelligence, Inner Beauty and Personality as they will be assisting many Charities during the year. 2002 Nancy after she Won the Title.